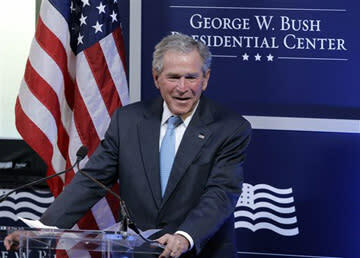 How much would you pay to get President George W. Bush to speak at your event? Almost immediately after leaving office, Bush withdrew from the broader bully pulpit that other former presidents, such as Jimmy Carter, have used to weigh in on matters of public import. But he also joined the storied ranks of former politicians who are now making money on the speaking circuit-- and it's paying off. That's undeniably a lot of dough--but consider how it stacks up against the fees collected by Bush's predecessor, former President Bill Clinton. By the end of 2009--nine years after Clinton's final term--the former president had already earned $65 million in speaking fees, which included $7.5 million for 36 paid speeches in 2009 alone, according to CNN's analysis of wife Hillary Clinton's 2010 financial disclosure report. That's $208,000 per speech on average for 2009. IWatch News reports that after declining to visit Ground Zero May 5 with Barack Obama following the death of Osama bin Laden, Bush gave three paid speeches that week--one to "hedge fund executives, a Swiss bank sanctioned for keeping secret bank accounts, and a pro golf event underwritten by the accounting firm involved in the Tyco International financial scandal." Bush is represented by the Washington Speakers Bureau, and a quick glance at the company shows that they also arrange speaking gigs for wife Laura Bush, daughter Barbara Bush, brother and former Florida Gov. Jeb Bush, and sister Doro Bush Koch. Doro Bush Koch charges $10,001-15,000 per appearance, according to the company website, and a speech from Jeb Bush costs $15,001-$25,000. Fees for Laura Bush, Barbara Bush and the former president are available by request only.